It is understandable that the public focuses on the exploits of our football heroes both in the professional and college ranks. These young athletes perform boundless feats on the fields of play. They throw touchdown passes and run through defenses with power and finesse. Few cheer for the head coaches, although it is their offensive and defensive schemes that are primarily responsible for the successes and failures of the teams we adore. 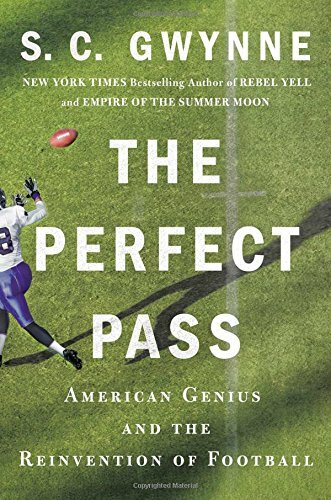 S. C. Gwynne’s new book, The Perfect Pass: American Genius and the Reinvention of Football, illuminates the fundamental importance of football coaches, in particular the contributions made by Hal Mumme, whose offense of pass-first-and-always revolutionized the game at all levels. Even a vigilant student of the game would have known nothing about Mumme. Starting as a high school coach in Texas and over his many-decade career in the college ranks, Mumme influenced both the college and the professional game. Gwynne follows Mumme’s journey with a riveting and enlightening narrative. Gwynne’s book is not for the casual fan. It is filled with plays Mumme diagrammed and numerous inside football explanations that are only intelligible to an expert. Even fantasy football mavens will find the text a challenge, unless they too enjoy dreaming up plays on paper napkins over a cup of coffee. However, it is worth the effort to decipher the interiors of what has become America’s national game. Gwynne explains the subtleties of the mesh offense, the heart of what the author correctly terms “the most innovative passing offense in America.” Mumme’s passing game could not be stopped, and his running game was not far behind. Football coaches acquire concepts and plays from each other, and Mumme’s offense borrowed ideas and designs he learned from other college and professional coaches. He would modify what he learned and then teach others in turn. With a few notable exceptions, college coaches lack job security. Every few years, even brilliant coaches like Mumme revolve from a school in one conference to a position in another conference, discharged for lack of immediate success or for no apparent reason at all. Mumme brought to the game a refreshing change in character—shorter practices, no stretching, light hitting, no screaming, no six-inch playbooks, no wind sprints at the end of practice. As a struggling football coach, Mumme brought optimism and inspiration to his team. He shared his dreams with his players, and they responded. He valued planning, technique, execution and timing, but not brutality. Mumme realized that his philosophy pulled against the tide. His innovations would have to be proven successful before they could replace the established norms of the game. He was not the first football innovator, but he perfected an approach that has now become the standard in the National Football League. Mumme coached a hurry-up offense with no huddles and multiple receivers reading defenses and making adjustments to their routes in the middle of plays. Gwynne tells the stories of Mumme’s college coaching experiences, first at Iowa Wesleyan, a small college in the tiny Southeastern Iowa town of Mount Pleasant. He built a program from the ground up, and he was fired after finding success. He was, as Gwynne says, a ”transformative figure” in the ranks of small college coaches. Part entrepreneur, part fundraiser and part con man, Mumme took every player available—leftovers, misfits and rejects—and plugged them into his forward pass system. He made the game simpler for his team to execute and harder for his opponents to defend. He changed the attitude of his coaches and his players. He was fearless, enthusiastic and confident. Hal Mumme changed American football, and S. C. Gwynne’s book ably relates the story of that innovation and the successes of the man who devised it.